"All Glory, Laud and Honor." The traditional opening anthem for Palm Sunday services, as performed at King's College, Cambridge, last year. The tune is "St. Theodulph" by Melchior Teschner (1584-1635), arranged by William Henry Monk (1823-1889). The words are by St. Theodulph (Theodulph of Orleans) (ca. 750-821) himself, translated by John Mason Neale (1818-1866). This rendition is more stately than those to which I'm accustomed; I like it. Triple banjo delight! Steve Martin, Tony Trischka, and Béla Fleck, "Crow." My first exposure to Steve Martin as a banjo player was at a Nitty Gritty Dirt Band concert at Carnegie Hall in (I think) 1975. He joined the band on stage, was introduced, and I thought, "That's the comedian guy; didn't know he could play." I decided he could play right well. Here's Tony, backing up fiddler Tashina Clarridge (note her appreciative laughs at 3:08 and 3:14), along with guitarist Michael Daves and bassist Skip Ward (more about these two later), doing "Sally Goodin" at the 2011 Joe Val Bluegrass Festival in Framingham, Massachusetts. I learned of Béla Fleck later. At first, I thought him a bit weird. As I developed more of an appreciation of jazz, which his style seemed to edge into, and saw the synergy between it and bluegrass, I came to like him very much. "Big Country" has Béla playing with a decidedly non-bluegrass backing band, having some woodwinds, including a bassoon, as well as a keyboard and steel drums. The bassist on "Crow" is Skip Ward. On "Crow." he plays acoustic bass. In the above clip of "Clean" by the Darren Lyons Group, he plays electric bass in a fusion piece, performed at B.B. King's Blues Club in 2011. ...at least in fifteen out of nineteen languages. 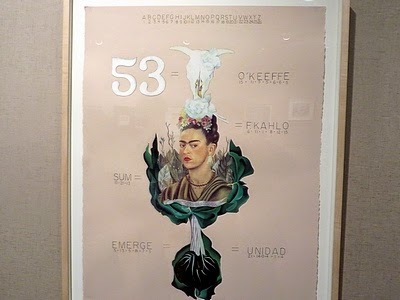 The number 53 corresponds to O'Keeffe and to F Kahlo, artists associated with New Mexico and Mexico, respectively. It also is the sum of the word "sum," as well as of "emerge" and of the Spanish unidad ("unity"). 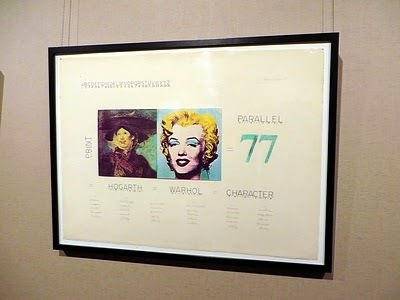 Similarly, 77 yields print, Hogarth, Warhol, parallel, and character: something for aspiring art historians to contemplate. 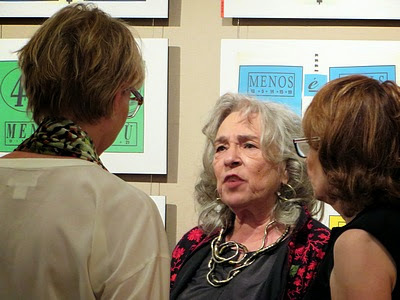 The centerpiece of Ms Shaw's exhibit, "The Summantics of Art," was her demonstration that the statement "Less is more," which I have always associated with Ludwig Mies van der Rohe, one of the preeminent architects of the past century and designer of the Seagram Building, but which statement Ms Shaw noted was earlier used by the English romantic poet Robert Browning in Andrea del Sarto, is true in fifteen languages using the Roman alphabet. 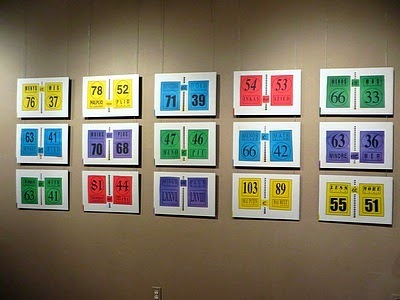 In each of these languages, including English, the sum of the numbers corresponding to the letters in the word meaning "less" is greater than that of the numbers corresponding to the letters in the word meaning "more." Ms Shaw admits this does not hold true for Polish, Serbo-Croatian, Gaelic, or Welsh, and wonders, "What could this mean?" At the time she developed her numerological system, Ms Shaw wasn't aware of its kinship to the Jewish mystical practice called Gematria, but was delighted to learn of it.